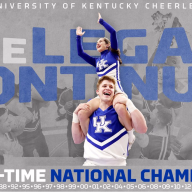 Discussion in 'Allstar Cheerleading' started by Kentucky Girl, Jan 16, 2019. Do you think that high school cheerleading is similar to All-Star Level 5 while college cheerleading is similar to All-Star Level 6 (except that travelling basket tosses are not allowed in college)? In some ways, but they're not completely parallel. While HS rules allow for some of the more elite stunts in level 5 (high/highs), I want to say that level 4 is a more accurate representation of what's allowed at the HS level (very loosely speaking). I'm not sure about college vs. level 6 because I don't follow it as closely. But there do seem to be more similarities between those two than with HS vs. AS (inverted baskets, 2-2-1's, etc.). To my untrained eye, anyway. SL&AM Slow your roll, Sparkle. In my district, high school cheerleadering isn't even a competitive sport anymore so it's in no ways comparable. However, some states have such highly competitive high school teams that you could run a parallel. I believe there are no double fulls in tumbling in college..I don't think in high school either, at least in this state.. I would compare it much more to 3 and and mostly 4 but not 5. Single twists only makes that inaccurate. are we talking current cultures comparisons? or skills? There's only 1 high school in my area who could enter as R5, although they did 1 1/2 up to heel stretch a couple years ago... (& if they allowed kick doubles & single leg double downs). Most school teams here are easily level 3 or 4. There are many highly competitive teams in Illinois. I only watched videos of them in recent years and I was very surprised at the caliber of skills. However, I'd still equate them to an incredibly strong 4 or R5 rather than a top caliber level 5 worlds team. Illinois is such an interesting beast. You are right, lots of talent, but they definitely live in their own bubble. I was watching some of the 'top state' teams and groups were using front spots (4 bases) on advanced skills and elite skills. none even at the super elite skill level. My local district? LOL it's like a mini rec level 1. Social suicide to be a cheerleader. Anyone that is interested in the sport cheers all star. The schools that win Counties would be a level 3 with a few kids that have level 4 skills. The schools that win States would probably be a level 4 team. The teams that have won states in the past also had kids that cheered at a well known and successful mega gym. But those kids either graduated or their comp schedule must have interfered with high school because they aren't on the high school team. It looks like this year we will have a new school win states. In our area (Atlanta suburbs), high school teams are awesome! Probably like R5 but I'm not really sure. CP is going into 6th grade and wants to try out for middle school comp cheer and those teams are pretty good too. Minimum requirement is BHS but most have higher skills I think. So lets compare what the maxout / high point scoring skills are for each.. So what level does that equate to on AS?